Leaf Chain is the most simple of steel chains, consisting only of link plates and pins. 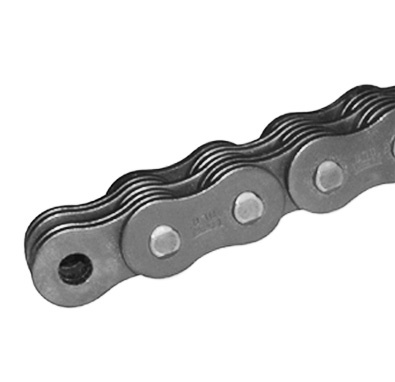 This chain generally has greater tensile strength than roller chains and runs over sheaves rather than sprockets. It is suitable for hanging, balancing or motion transmitting applications. Leaf chains are often used as counterweight chains for machine tools, elevator and over doors, fork list truck masts, spinning frames, and similar lifting or balancing applications. Plates are connected by pins and hold the same tension loaded onto the chain. The pins are designed to resist the shear force from tension loading applied by the link plates. The pins are also designed to withstand abrasion from the middle plate holes when the chain articulates. AL TYPE = Plate configuration and thickness are the same as ANSI standard roller chain. Pin diameter is almost the same as ANSI STD RS Roller Chain. BL TYPE = The outside dimensions of the plates are the same as ANSI STD RS Roller Chain inner plates of the same pitch. The plate thickness is the same as one size up Tsubaki RS Roller Chain. BL series can, in most cases, replace the older AL series leaf chains. Consult Tsubaki Technical Support for interchange information.